If you are a teacher, parent or friend to someone wishing to learn more about their Jewish heritage, then you have probably been asked various questions about Jewish living and Jewish values. While some questions may have been easy to answer, others have been harder. However, it was on a Yom Kippur afternoon in the Radlett Centre when Rabbi Leo Dee was asked what is probably the most important question for any Jew: ‘Rabbi, isn’t the Torah just an ancient text that is out of date and irrelevant in our modern age?’. This question – which should be presented to every Rabbi, Rebbetzin & Jewish educator when applying for a new job – gets to the roots of Jewish living. However, few people are actually prepared to ask this question, and few educators are necessarily prepared to answer it. As Rabbi Dee explains, ‘in the microsecond after he uttered those words, I sensed a level of relieved endorsement from within the packed auditorium. This was clearly a question that others had wanted to ask, but none had had the guts to pose.’ So how did this dynamic and thoughtful Rabbi answer this question? To find out, you’ll need to buy Transforming the World: The Jewish Impact on Modernity. This refreshing book contains 66 short essays in which Rabbi Dee addresses this question from three different perspectives: How does the Torah transform my life for the better? How does the Torah transform the wider world for the better? What is the future of the Jewish people in a modern world? In each essay Rabbi Dee highlights how Judaism has transformed the world as we know it, and he explores ideas connected with education, charity, Shabbat, justice and much more. Though the book is primarily pitched towards teenagers and young adults, it is a book that, as Rabbi Jonathan Sacks writes in his approbation, can ‘inspire young and not-so-young Jews alike’. Transforming the World provides a clear description of how Judaism has changed the world for the better, and it offers compelling arguments for Jews to be proud of their Jewish heritage. This review originally appeared in Rabbi Johnny Solomon’s weekly newsletter. What emerges is an extraordinary story of someone truly committed to the essential elements of the Modern Orthodox ethos, tapping into the inherent tension between Torah culture and that of the surrounding world to tease out unique insights into God’s creation. Tying these carefully selected anecdotes to the motion pictures he reviews, Rabbi Cohen accomplishes the improbable: eliciting divrei Torah from what otherwise might be considered frivolous entertainment. Moreover, through his love of both Torah and film, Rabbi Cohen brings to the fore the comforting attributes that both religion and popular culture share in their inherent relatability. Kosher Movies succeeds in promoting some ideals that in many quarters have been considered passי, namely the effective synergy of the devotion to Torah and the careful application of general, in this case, popular culture. Coming of age at Yeshiva University in the 1960s, arguably the zenith of these ideas, Rabbi Cohen rejects the contemporary notion that the Modern Orthodox approach is intrinsically flawed and does not work. On the contrary, he states that “We learn about God not only through His words but also His works. My task as a teacher of . . . film is to give students the tools to discriminate between the wheat and chaff of secular culture.” Rabbi Cohen’s unapologetic love of both Torah and movies is evident throughout. Though the book contains the necessary caveat that one should consult movie parental advisories to determine the propriety of films in family and school settings, Kosher Movies remains a strong advocate for watching films through a specific lens of Torah. Western society, both Jewish and secular, has taken many turns since the first feature film and the heyday of Modern Orthodox thought. In an age of abject permissiveness in secular culture and the meaningless hollowness of the trend of “Social Orthodoxy,” Kosher Movies reminds us that there are spiritual and inspirational nuggets of gold to be discovered and harnessed from the world around us as depicted in popular culture that truly complement a Torah lifestyle. This review originally appeared in the Spring 2016 issue of Jewish Action. 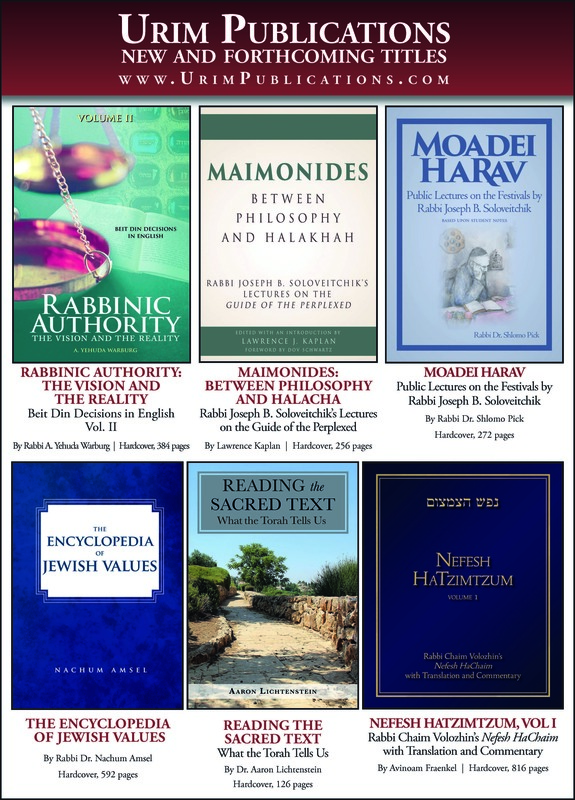 You are currently browsing the Jewish Book Review blog archives for April, 2016.